Now that the main loop of track is complete and running&nbsp I thought it would be fun to add more visual interest with a second train shunting automatically back and forth on the station and mine spurs as the first train racks up miles on the main loop. To accomplish this, I picked up a Circuitron AR-2 auto-reverse circuit at my local hobby shop. The AR-2 comes complete with a pair of optical sensors that must be installed between the ties at either end of the train's run. 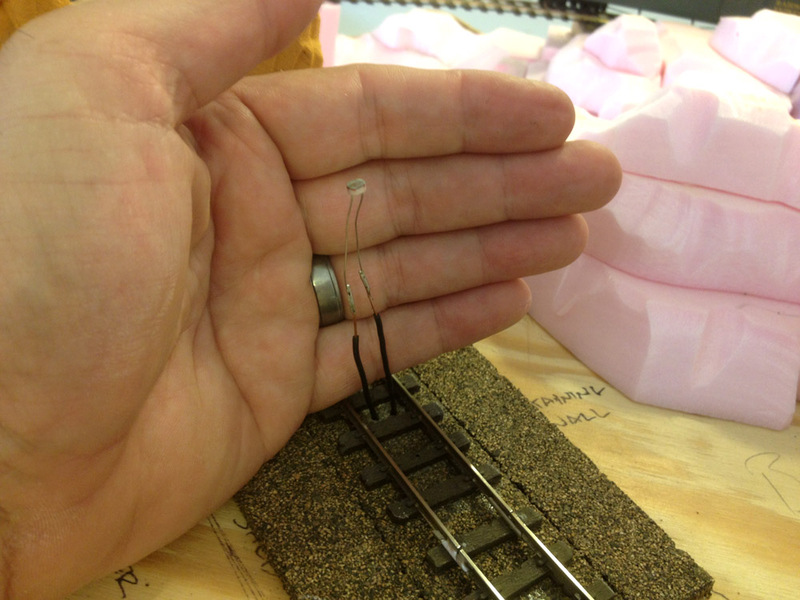 One of the tiny optical sensors ready to be installed between the rails. Now, wiring and electronics are probably my weakest skills in this hobby, but I was able to follow the simple instructions and diagrams without trouble and the installation went off without a hitch. Optical sensors installed at both ends of the run. The two optical sensors are installed in the desired positions on the layout and then wired to the circuit board. 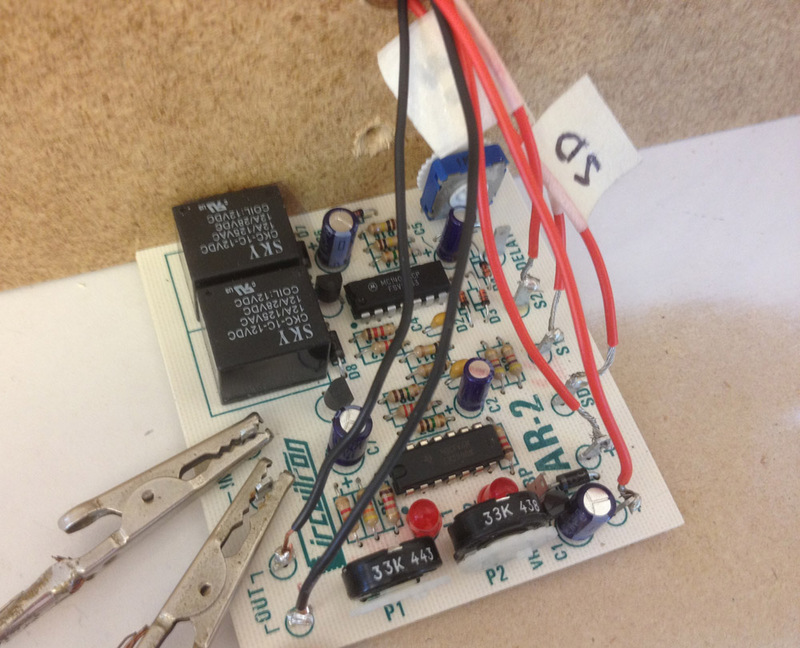 Power feeders are soldered between the rails and the board and then between the board and a DC power pack. The final step is to attach power to the unit from a 13 to 18 volt AC or DC power source. I used the 18V AC terminals on an old MRC power pack (note that exceeding 18V AC will most likely burn up the unit and void the warranty). Everything wired up, soldered and ready to test. 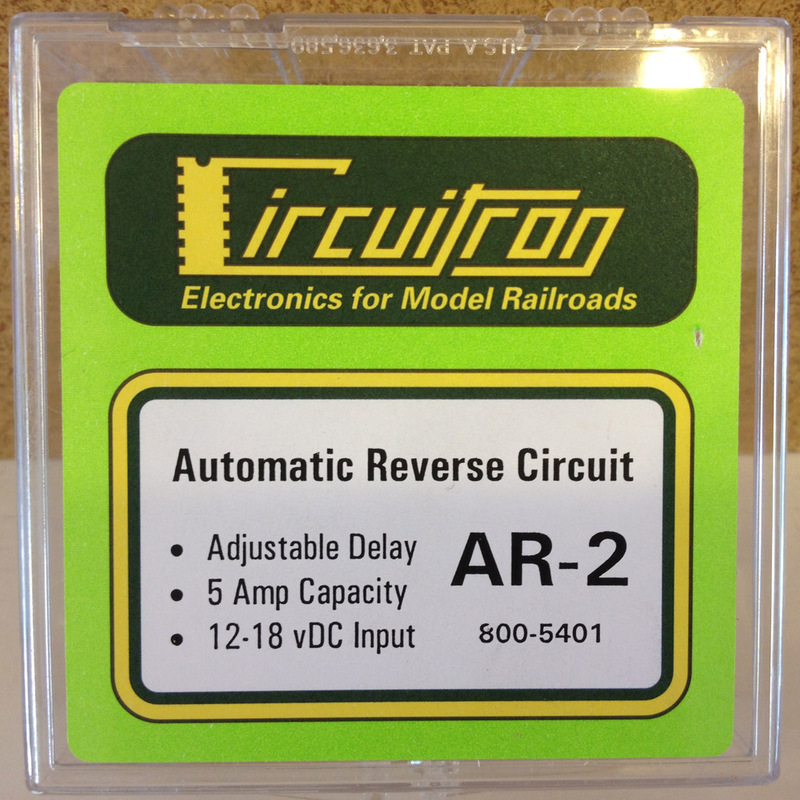 A great advantage of the AR-2 is that you can set a timed delay at each stop, from a few seconds to a few minutes. I set mine to delay about 20 seconds at each stop. I should mention that since this is basically just an automated polarity reversing system it is only useful with DC systems and will not work for DCC. Of course, I'm a big believer in having my cake and eating it too so I'll be wiring the layout for both traditional DC and Digital Command Control. When all the wiring is done I'll be able to flip a switch or two and choose between automation like this, DC cab control or full DCC. If I do it right, I'll even be able to operate some blocks on DCC and others on DC. 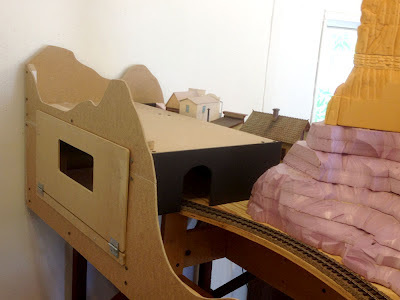 I tend to put off wiring projects as long as possible but this one only took about an hour to complete and now I have two trains running on Thunder Mesa! Thanks to Circuitron for creating a great product that has me excited about other automation and animation possibilites for the railroad. More to come! 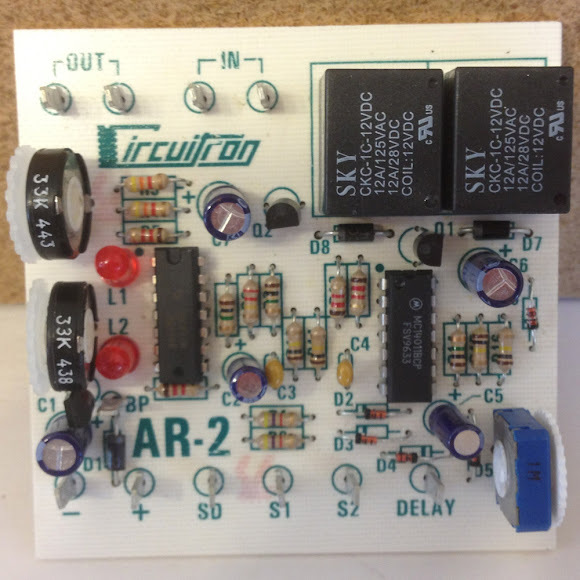 Although the Circuitron AR-2 has performed flawlessly, I am no longer using it on the layout. As the railroad has grown, my focus has shifted from simple display to more realistic operation and I'm now using DCC to run trains almost exclusively. The AR-2 unit has been uninstalled from the layout, but I may bring it back in the future to automate trains on the upper level On18 Calico line. I had a little time to work on the railroad over the last few days and decided to go ahead and install the fascia or profile boards. 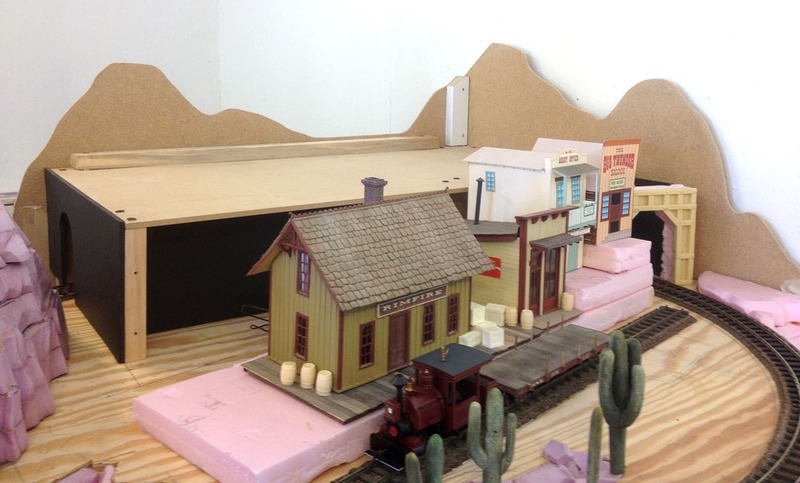 This really gives a nice, finished look to the layout and helps to define the edges of the little world I'm creating. I used 1/8" masonite attached with Liquid Nails and clamped in place with 1" drywall screws. Once the adhesive cures completely, I'll back out all the screws, fill the holes with wood putty and get it ready for painting. Future location of the Geyser Gulch trestle. Now, how am I going to make those geysers erupt? Hmmm. While adding the fascia I also completed work on the Rainbow Caverns show building. This is basically a masonite and black foamcore box that will hold the black-lit cavern effects I'm planning while also acting as a support structure for the upper levels of Thunder Mesa town. I incorporated a hinged access hatch into the fascia for maintenance and photography inside the caverns. It's held in place with magnetic cabinate latches and swings down out of the way when opened. Rainbow Caverns show building and access hatch. The tunnel entrance will be disguised with rock work. Viewing portal for Rainbow Caverns. Rainbow Caverns show building from the Thunder Mesa side. 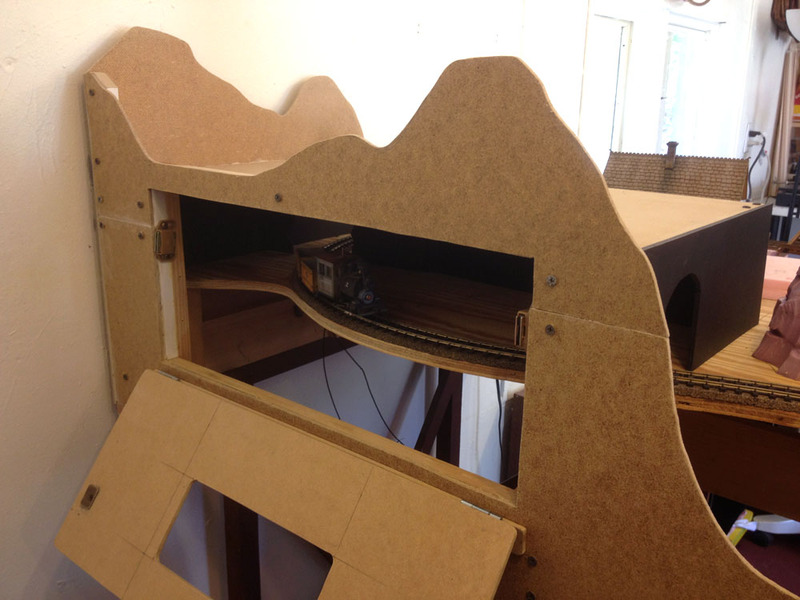 Now that the major carpentry is finished the logical next step would be to finish roughing in the scenery. I might do that, or I might start work on some long delayed locomotive or rolling stock projects. Or I might do something completely different like get the backdrop painted. Who knows? 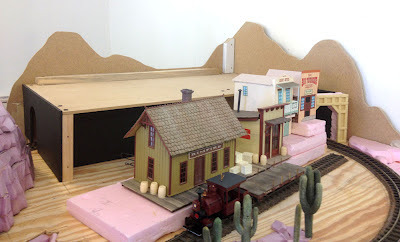 The wonderful thing about a model railroad is that there is never any shortage of interesting projects to work on! Hooray! Track laying is now complete on the Thunder Mesa Mining Co! Now I can finally get to the fun part of actually running some trains. 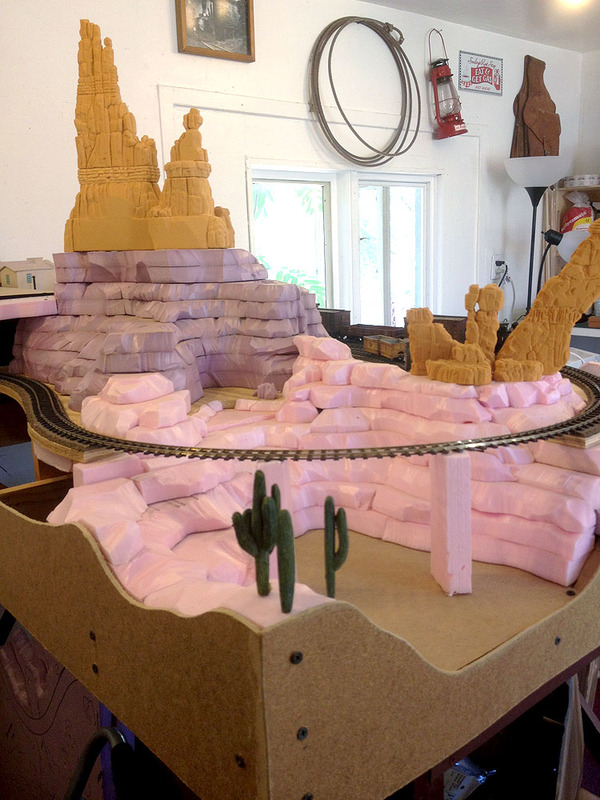 Even though it's a small layout, it's still a thrill to lay that last bit of track, hook up the power pack and watch the trains roll on by. Here's a quick 2 minute video I put together as I tested track and connections. 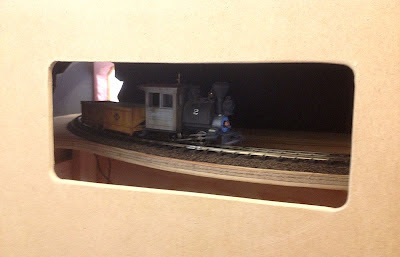 I've used Peco code 100 On30 track throughout. 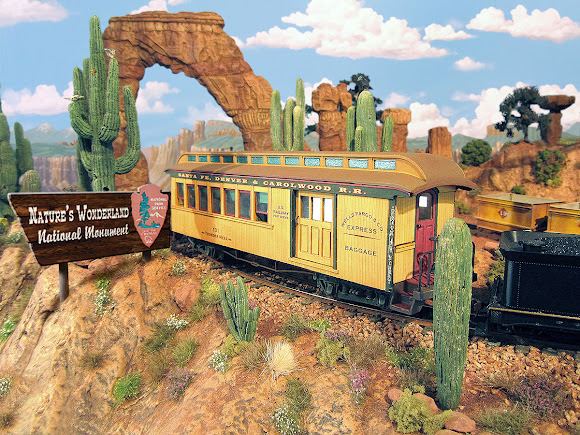 It's extremely well made, reliable and matches the rustic look I'm going for on Thunder Mesa perfectly. Plus, I had a lot of it left over from the previous layout. Of course, laying the golden spike on a model railroad doesn't mean you're anywhere near finished. There's still tons of work to be done on scenery, structures and special effects. 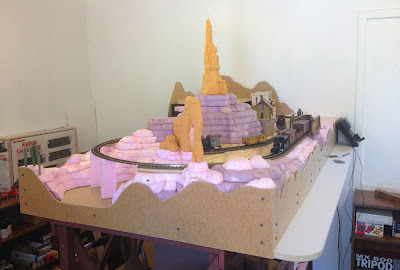 Now that trains are rolling, I'm even more motivated to tackel those big projects. See you on down the line!